Superb for general office use, meeting rooms, conferences, receptions, etc. Durable, generously padded seat/back covers. Made from lightweight fabric for everyday use. H x W x D: 830 x 530 x 420mm. Having chairs that offer flexible seating arrangements can be extremely useful, especially when the seats aren't going to be in constant use and it means they can be placed in storage so they are not in the way. 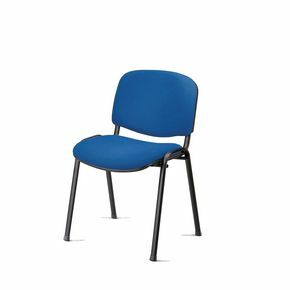 Our stackable meeting/conference chairs offer flexibility and are superb for general office user, meeting rooms, receptions, conferences, etc. These chairs are made from light weight fabric which is great for everyday use and it is fire retardant fabric meaning they are safe. They have a seat height of 460mm making them a comfortable height for most users, along with their durable and generously padded seat and back covers. There is a choice of two frame colours; black or chrome and four fabric colours to pick from; blue, charcoal, grey or red, all of which will provide you with stylish chairs. Our stackable meeting/conference chairs are flexible and easy to store; they are supplied in a pack of 4 and they come with a 12 month guarantee and FREE UK Delivery.